People face several problems while growing bottle gourd in their home garden. Many people have asked questions, why the small gourds do not grow and fall off, what are the types of gourds, what is the best fertilizer for bottle gourds. Continue reading below all the questions and answers on gourds and their use. Q. Why the bottle gourd plant produce only male flowers? A. The gourd plants produce mostly male blossoms initially early in the growing season which fall off, but will produce female flowers after some time. Q. Why the bottle gourds prematurely drop after growing of 4-6 inch long and do not grow to full length? A. This happens when the flowers are not being pollinated. The pollination is anturally carfried out by insects when they take the pollen from the male blossoms and then put it on the female blossoms. You can try hand pollination. When the female flowers open in the evening, get a male floweer, remove its petals to expose the anthers and gently dust them against the stigmas of a female blossom. Q. How can I get more flowers and more gourds from your bottle gourd vine? A. Correct pruning technique can encourage your bottle gourd plant to produce more gourds. The main vine produces only the male flowers. Discard all the side growing branches and let the main vine grow to about 12 feet long, then cut off its end. This will grow lateral branches which will produce the female flowers. You can again prune these lateral branches when they have grown about 2-3 sets of leaves. Q. What fertilizer is recommended for bottole gourd vines? A. If you have added compost and manures in this soil at the time of sowing the seeds, then additional fertilizer is not necessary. You can feed a with a liquid fertilizer high in potassium. Do not give a high nitrogen fertilizer, it will encourage leafy growth only. Q. What are the types of gourds? Lagenaria Varieties: Lagenaria gourd is of several shapes including the bottle gourd is widely eaten. They can be dried and used as bottles, birdhouses and serving dippers. The mature and dry fruit makes a great bath sponge. The Lagenarias include bottle gourds, dipper gourds, speckled swan gourds, powderhorn gourds, etc. Luffa Varieties: Luffa gourds are edible, these can grow up to 2 feet long. It is a utility gourd, the dried lufa gourd is used as a bath sponge. Cucurbita Varieties: These are colorful ornamental gourds of the Cucurbita genus and are used to make good decorations. Following are the questions and answers and comments from many people. Please read all the following comments and if you do not find the answer of your question, then ask the question. Thanks a lot for the hand pollination tip. The fruits are now growing!! I noticed that some of the fruits have brown coloration towards the tip of the fruit. Is this something I need to worry and take care of? I think, the brown colour should not be a concern. The colour will change to green as the fruit matures. I have a vine that is growing 5 ft long bottle gourds. What is causing this to happen? Looks very weird. I did not do anything metioned in this article about plucking away female flowers etc. I have currently 10 dudhi hanging each 4-5 ft long. There is some varieties of bottle gourd which produce very large fruits if they get proper growing conditions. 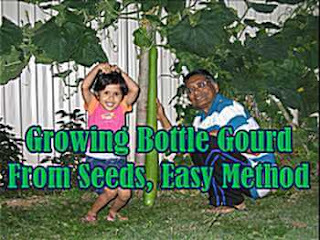 I have also grown bottle gourds of length 4-5 ft. The bottle gourd plant will not regrow. When the plant finishes, you should pull out the roots. 1. Sometimes it appears that pollination had taken place, but actually it didn't. Repeat hand pollination on each flower 2-3 days. 2. Small pests may not be the problem. How to save lauki seeds from fruit, I grew lauki from seed I got from a friend, the last lauki I picked had hard seeds but edible flesh. You separate the seeds from the flesh. Eat the flesh. Wash the seeds and put in sun to dry. Store the seeds in a closed container. They will germinate in the next season. I am doing this for the last several years. Further to my above comment, if you really want to take seeds and preserve for the next season, you should wait for the bottle gourd to over ripe on the vine. The seeds of such a gourd will be matured ones. Wash and dry them and preserve. However, you can preserve any hard seeds that you can find while using a bottle gourd. 1. Cut the growing tip of branches more than 1 m to encourage flowers. 2. Add cow manure or some other organic manure in the soil. 3. You may use bone-meal in the soil, but the above 2 steps should yield fruits. I see a bunch of 5-6 small buds each, everywhere on the plant. And i see many flowers all around the plant. The flowers are blooming for one day and then wilting and falling. Please advise. Which one is male flower and which one is female? And what can i do? 1. On the female flowers, you will see a tiny bottle gourd shape beneath the flower. See the pictures of male and female flowers above. 2. Initially the male flowers will be formed which may fall off. 3. Just cut off any side branches reaching about 1 m long to encourage female flowers to form. Which flower actually produce fruit ? Thanks for the information but i want to know do i need to pluck the male flowers to pollinate female flowers. Female flowers produce the fruits. My one day plant has seed intact on leaves, please let me know what to do. Don't worry, the seed will fall down and new leaf will emerge. This is the birth of a new plant. You mentioned that pot needs 50cm dia. I have 30cm dia and 40cm height grow bags. Is it enough for bottle gourd ? actually my plant leaves were turning yellow and white spots were occurring on the leaf .so, i chopped all the leaves and some of them which were not infected i did not chopped,is it correct? Yes, this will work well. It is advisable to chop off the infected leaves. You may spary milk solution on both sides of teh leaves. Mix 10 ml full fat milk in 1 liter water and spray. When the plant grows to 1 m long, cut the growing end. This way the plant will bear more female and male flowers. Then you may hand pollinate them. Hi, How often cow manure should be put it in to the soil? What's the best practice? Can I use Bio-farm manure? Hand pollination helped. Thank you! Please tell me how to take care of gourd plants during summer. My plant is producing lots of male flowers and very few female flowers, I have karela plant. Please advise. Cut all the branches which have grown to about 2-3 ft long. The new growth will have both male and female flowers. Lot of good information. Thank you !! My major problem is I am planting seeds since past 3 years not a single saplings sprout. I water them regularly and also soil is good as my other vegetables are growing in the same soil. But have hard luck with Dudhi plant, not sure if I am doing something wrong. This year I had 1 seed that sprouted but next day that small plant was eaten by some bug. 1.One reason for seeds not sprouting may be that the seeds are not good. 2. Soak the seeds overnight in water and then plant in the next morning. if raising seedlings in a small pot, then place the pot in a warm or morning sun postion. Dear sir in my bottle gourd plant there are so many male flowers but not a single female till date what should i do? Cut all the branches more than 2 feet long. The new growth should have both the male and female flowers. I have planted Tindora in pot but when it was about 1 foot , I have tranffered it to big box but after that it just not look good . The leaves look littele down and not shiny as it was before . What shoul I do to help them ? My bottle gourd is not producing any female flowers. Is there any remedy for it? Sir, I bought 2 type of thin lemon tree 2 years back. I gave a big pot and fertilize every 15 days. Yet there is no fruit/ lemon. Please help. If there are no female flowers, trim all the branches more than 2 feet long. The new growth should have both the male and female flowers for pollination and fruit formation. You may try cutting a few branches without flowers and leaving a few with female flowers. Anyway the existing female flowers will fall off without germination as there are no male flower at present. I think, it is a very long variety. It will grow in width also after some time. Thanks for your reply. 3 of my plants already turned yellow what can i do? Also is it ok to plant pumpkin plant and cucuzza plant side by side? your picture shows that female flower with tiny fruit. Does it mean that since tiny fruit has developed and it doesn't require any hand pollination? The female flower with tiny fruit does not mean that the fruit has developed, it is actually the ovary. The female flower needs to be pollinated by bees or by hand pollination. When it is pollinated, the flower will close in a day or two. Hey there. This is my second year growing cucuzza. Last year i was pretty successful, however this year i noticed brown dry rot looking stems. In the last 2 or 3 three weeks it has moved up the stem. The brown dead looking stem now starts at the dirt and is about 2 to 3 feet upward. The plants have some yellowing leaves and is not yet producing large fruit. There are lots of bees around and other plants are pollinating fine. One plant has about 4 fruits on it, 2 are growing very slowly and the other 2 dont seem to be growing at all. About 4 weeks ago I gave the plants some phosphate in a granular form. There's a good chance I might have gotten some on the plant Stem. Not sure if this is the problem or what to do about it. My 8 plants have grown well and yielded some fruit. The last 3 weeks, the leaves towards the bottom of the plant turned yellow, then brown and died off There are NO green leaves at the bottom 6 feet of my 15-20 plants. Plenty or yellow ones. Fruit appears to grow OK. We have received plenty of rain this year, and I water often. The ground around the ground around the plant appears moist. Am I overwatering, under watering, what could be wrong? 1. Older leaves can become yellow due to the aging. It is normal. 2. Deficiency of nitrogen. Feed fertilizer. 3. Bacterial Wilt (Pseudomonas solanacearum) causes leaf surface wilting and yellowing of the leaves. 4. Powdery white spots on the undersides of leaves and yellowing leaves are due to fungal disease Powdery mildew. 1. Remove the infected leaves and destry them. 3. Too much water and poor drainage can encourage fungus diseases. So improve drainage. 5. Spray plant with neem oil spray. Please see my reply to the next question. Both my bottle gourd and ridge gourd plants have growth well. They both are more than 6 feet long but I am yet to see a flower. ? You may feed some liquid fertilizer high in potassium like seaweed solution or comfrey tea. sir how do i know when my bottle gourd is ready to eat? My bottle gourd is infected with squash bugs, any home remedy to get rid of those? Also I left one bottle gourd to over ripen for seeds,is it going to slowdown more fruits production. When your lauki grows to a sufficient size, press your one finger nail in it. if the nail easily goes into the lauki, it means it is soft and tender. At this stage you can pluck the fruit. When the lauki becomes hard for your nail to penetrate, it means it is getting over-ripe. 1. Most of the bugs and pests can be controlled by spraying Neem oil spray. 2. For making seeds, the gourd should not be plucked until it is very ripe and drying. remove the gourd and hang it is shade. Take out the seeds and store in an air-tight bottle. 3. Yes, it may slow down the production of fruits, however, it depends on the health and size of the plant. Sir, Thank you very much for a very informative journal. My first experiment at growing bottle gourd is now bearing fruit however one of my plants is infested with bugs under the leaves and beetles and these have stunted the growth of that plant. I have sprayed the plant with neem baan pest repellent but it is having no effect on these bugs. I am concerned that these will start to spread to my second plant which is now fruiting. Please guide me. First of all remove all the infected leaves and destroyed them. Try spraying milk solution on both sides of the leaves of your both the plants. Sir.. i have grown a bottle gourd plant... the flowers are pollinated but d problem is that the fruits wont grow to more than 1 inch.. some gets spoilt and rotten and the good ones dont grow even after having sufficient soil n water supply... what should i do? If the fruit does not grow more than an inch, that means that the flowers are not getting pollinated. Please try hand pollination as explained above. sir i have grown bottle gourd plant 2 months ago. it produces only leaves n no sign of fruit please suggest me what to do? Thanks for all this information. I have an enormous gourd plant( planted it on the ground ) all of the branches are more than 1 meter long, which branch do you recommend to cut so I'll have more female flowers. My gourd fruit will split /Crack when they are 2 inches long, what causes that? Cut off the growing tips of all the branches that have grown about a meter long. This will encourage flowering. Cut off the growing tips of the branches which are about 1 meter long and have no female flowers. hi..i read all ur posts...i have grown bottle gourd in my kitchen garden( pot is as u suggested height n width).plant has grown very good but thing is buds are getting dry n falling down..buds r not blooming in to flowers ..please suggest me why and what i have to do. 1. Probably there is too much nitrogen fertilizer in the soil. Add some cow manure in the soil and keep the soil damp. This article is very helpful. My mother has been able to successfully grow lauki after I had pointed her to this post. I am publishing a post on lauki halwa for my blog Andcakestoo and I am linking your article, in case some of my readers would like to grow their veggies. Great work. Thank you. Thanks Dr Shreyashi Ganguly. I am glad that your mother has successfully grown lauki. I am very much interested in knowing the recipe of Lauki Halwa and Cake. I also have a cooking and health related web site and would refer your recipe there. Sir I have three healthy saplings of bottle gourd in one ft. pot. Six to eight leaves each. Will they grow in it or should I transplant them. How deep their roots go so that I can know how big pot I need. Can I use 1 ft deep and 2 feet wide crates and sow al three saplings in one . For past few days no new leaves have come . Which fertilizer should I use to increase its length. Urea or NPK. 1. You can use 1 ft deep and 2 feet wide crate for planting your gourds, only one plant in one pot in 1 ft round pot. 2. Urea is rich in nitrogen, so not good. You can use a NPK fertilizer initially, but later a fertilizer rich in potassium will be better. Is it okay to sow bottle gourd in the month of October, I live in Bangalore and planning to sow in my balcony garden in a pot. It is not the correct time to sow the seeds in Bangalore in October as the winter is approaching. The best time in India is spring/early summer. i planing to planting bootle, gourd but i really curious my area not full sun because so many trees here. to shade its about 2 meters to get full sun i ready make trellis. and i plant luffa gourd and others. Thank you for the Good information. very helpful. I dried my seeds in the sun. How do I store them until I plant them next spring? in an air-tight plastic bag...in paper bag....in jar with lid.. in refrigerator or in the dark? If you do not get enough direct sun light, then plant in a place which receives direct sun light for maximum time. You will be able to grow gourds but with reduced harvest. Place the seeds in a zip lock bag and store in a shade area. Sir my bottle gourds are getting burn from bottom part what should I do? No flowers and fruits stay for a long time and it get damage. ( http://www.mykitchengarden.info/2014/03/mulch-guide.html ) at the base of the plant. 2. The flowers are not getting pollinated. Try hand pollination. There is no pollination of the flowers due to insufficient bee activity. Try to pollinate by hand. I want to grow bottle gourd on my terrace in pots. you have give plenty of information but still i have some questions. 2 I stay in Mumbai, can i grow in this month. it is quite hot. 3 my terrace get sunlight for 1/2 day in the morning. does morning sun is must? 4. I do not want to use chemical fertilizers. i want to use only organic fertilizer. Is it OK.
1. Transplanting is not necessary. You can sow the seeds directly in a big pot. 2. You can try to grow this month. 3. Whatever sunlight you get, you place the pot there, it will be OK.
4. Chemical fertilisers are not necessary at all. You can use compost, cow manure, wood ash and seaweed solution. My neighbor had long bottle gourds growing up in her tree many years. This past year, everyone she gave the squash to became sick from the squash, though the seeds and plant look the same as usual. Do you think it was in the soil? My bottle gaurd plant is having only two branches. Leaves are also scanty. Plant started bearing both male and female flowers. I hand pollinated three female flowers but at a time only one showed good growth. Only after plucking this fruit when it was about 35 cm long did the second fruit show the signs of growth and the third fruit is waiting for its turn to grow big. Why is it so? It appears that your palnt is weak and not growing properly. Give some fertilizer. Suggest remove all the flowers and let the plant grow before it can bear fruits. Hi, my bottle gaurd plant female flower not developing they turning to brown, male flower seems good but female flower not good not developing into fruit. It is a common problem due to the absence of bee activity in the area. The female flowers are not being pollinated. Please try pollination by hand as explained in the article and other replies. Thanks for the information , could you please look at my profile pic .. My plant female flowers turning brown from bottom. I can't to pollination as the flowers didn't bloom ( not opened) they turned brown before opening. I looked the brown female flower. You cannot pollinate such flowers. The reason for not blooming of flowers may be either the plant needs to grow more or excessive water. Try cutting the tip of the growing branch to encourage new growth which will bear more flowers. I think, the fruit will be safe to eat. Thanks a lot. Your site is very informative and useful. If your gourds are small and becoming black and not growing and getting rotten, that means that the flowers are not being pollinated in the absence of bee activity in your garden. Try hand pollination as explained in the article. Thanks very much for sharing the manual pollination tips, i had very healthy bottle gourd creeper with many female and male flowers. The female flowers (100s of them) use to die after few days due to lack of pollination. I tried this manual method and it seems it s working i can see more than 20 gourds growing well. One question how many female flowers can a single male flower can pollinate ? I used manual method to rub male flower on female flower, Also how can we make the gourd long. It is good to know that you have been successful in hand pollinating your gourds. Yes, you can use one male flower to pollinate many female flowers, if you use a small paint brush to pollinate. You could also remove the petals of the male flower and just tap it (zatko) in the female flower. This way you can pollinate many female flowers by a single male flower. The number of days in which the seeds germinate depends on the temperature and dampness in the soil. If the temperature is 25+ deg C, the seeds may take 10 or more days to germinate. Soaking the gourd seeds in water for overnight speeds up germination. Germinating bottle gourd and cucumber seeds should not be a problem. I generally germinate them in a small pot filled with fine soil mixed with river sand. You mix sand and garden mix in equal ratio, sow the seeds, put in sun and keep damp and wait for at least 2 weeks. I farming bottle guard in block soil, but plants are not speed growth? Please inform me about best results and growing tips and fertilizer details. I live in a region where the night temperatures is around 36-45 degF and day time is in 60 degF. Can I start seeds outdoors for Bottle Gourd and Cucumbers or do I need to wait till the nigh temperatures raise to 50s? It is a bit early to grow the seeds outdoors. You can try indoors by placing the pot in a warmer place like near fridge. Hi! this is my first time so i have no idea in this field at all. I had a bottle gourd plant which gave me one fruit and it increased to 3 inches also. suddenly, the fruit started drying and changed to brown colour. I could see one more fruit which also dried and changed to mud brown colour. I could not understand anything. Can you please help? The reason is the flowers are not getting pollinated. You can try hand pollination as explained in the article and other above replies. My gourd fruits (the female flowers before blossom) are turning reddish- brown and rotting. I made a vertical section to examine, I found reddish brown flesh inside as well. Kindly tell possible reason. If it is due to over-watering, how to determine optimum amount of water as it is very hot summer these days. Hi I planted my lauki seeds ,it's been 24 days only 2 seedlings out of 8 emerged. The first one germinated about 5 days ago the tiny leaf were not healthy they looked like they are burnt , that seedling is totally dead now. the other one germinated that also a part of leaf looking like burnt . I used miracle grow organic choice potting soil ,it's very light smells like manure when I opened the bag and gets dried up fast. I started indoors soaked seeds overnight and keping it next to sliding door facing east , can you please tell me what am I doing wrong or any suggestions about sowing directly outdoors .i got seeds from Amazon, I live in Maryland , thanks ! 1. Now a days after growing 7-8 feets around the leaves near to root starting turning yellow then brown crushed and falling off, its going one by one up starting from near root. Please suggest if i am over watering or watering less. I water once a day in morning. 2. Other two seeds i planted in small pot and once they grew slightly(1-2 week old) i shifted to bigger pot but they died in few hours. What precautions we should take while transferring? 1. After growing for 6-7 feet the leaves started turning yellow and then brown crushed and falling starting from roots and then going upwards. Am i watering less or over watering plants.I water about 2/3 mug every morning. Please advice. 2. Another two seeds i potted in small pots and once they grew 5-6 inches they dried down and fell. What could be the reason because i shifted to a more sunlight area once they grew. I live in Pune which is not very hot but till 37-38 in summers now a days. Looks like the potting soil contains manure which is burning the the plant. Or you are not watering properly. Keep the soil damp. If 2 inch below the top soil is dry, it means the plant needs watering. May be your lauki plants are water stressed. Put a thick layer of mulch on the soil and water regularly. During intense sun, creat shade. Do not put young plants in intense sun. I am planning to grow lauki in New Bunswick, Canada. Our growing season is quite short generally 1st week of June to 1st week of September. One of my friend gave me four lauki plants. Wondering whether I should plant two plants together in one hill or 1 plant in one hill. Also planning to put lots of sheep manure at the panting time with slow release 12-4-8 fertilizer. After two weeks I am planning to use slow release 6-12-12 fertilizer every two weeks. Not sure what type and how much fertilizer I should use. Will really appreciate if you please comment on the planting and fertilizers mentioned above. 2. The second fertiliser should be given when the vines have grown to a few meters and they start to flower.Do not fertize near the main stem coming out from ground. Liquid fertilizer is best. You can use fertilisers for tomatoes. I have been growing bottle gourd in my kitchen garden for the past 8 years, however for the last three years, the plant does bear fruit. But suddenly the entire plant dies in a matter of couple of days. The leaves wilt and the plant dies. This takes from about two to three days. I have tried spraying with bavastin, mallethon, Rogor, but to no avail. please advise. My vegetables become hard at an early age and are not tender. Pls help. It appears, the plant is water stressed. Water regularly. Dear Mehta, I found your site very informative and unique. Every year, I get little fruit as most female flowers die, as I hadn't known due to not pollinating and also gets very long. Now I see all the female flowers have nearly burn out, and one male flower still 'alive'. Is it too late? It appears that the plant is infected by fungus. Cut the fruit and vine at about 6 inches below the fruit and discard the fruits. Spray with a fungicide like copper fungicide. Repeat after 2 weeks. Avoid spraying water on the leaves and stems of the plant to stop developing fungus. You can still try to pollinate. If no male or female flower left, then cut the growing ends of the branches. You may still get some flowers on the new growth. Good luck! Thanks Mehta. How to water the plant and frequency pl. Water on the ground near the main stem, try no to wet leaves. Wet leaves can be attacked by fungus and other diseases. In hot summer days, you need to water daily in the morning. The plant is diseased. remove the fruits along with 10 inches of stems and discard. Spray with some copper fungicide. Apply fungicide again after two weeks. Hello Sir,I read the above replies and they are extremly good. I am trying to grow lauki in my window grill.I had so far 5 female flowers with tiny fruits which grew upto one inch,then stareted becoming brown from top end and gradually died without growing.What is the problem?Is it disease or lack of hand pollination? It is no disease. The lauki flowers are dying because of lack of pollination. Which fertilizers should be used plz name it i am growing it on my home and there is some problems when ever fruit comes it get burned and fall down also now days there are lots of white patches on leaves..! Plz help and name the fertilizer to be used and how to use it..!! You apply cow manure around the plant. For the treatment of white patches, make a solution of 10% milk (add 10 ml milk in 1 liter water) and spray on both the sides of leaves. Fruits are falling, may be because they are not being pollinated. The fruit is firm and you can slightly push your finger nails. The fruit will start turning yellowish when it begins to ripen. Can you please let me know where i can find or prepare Neem Oil Spray. My bottle guard is infected with white and brown color small insects. Also There are numerous ants on the vine. Will neem oil spray work on it. If yes how to prepare it. If No, What else can save the vine. Neem oil spray should work. Mix about 1 ml neem oil in 1 liter water and spray. If you cannot find neem oil, get some neem tree leaves and boil them in water. Dilute the solution and spray. I tried neem leaves soltion that you mentioned and spayed it three time on gap of two days, it controlled somewhat but problem still persist, now the vine main body start to grey out in some potion due to pests. Do not spray the neem oil for 10 days and watch the plant. It may recover, I hope so. Dear Sir my problem is on my bottle gourd there is some kind of brown sticky thing and green insect on leaves. Kindly suggest me what to do. You can do 2 things. First spray both the sides of the leaves with neem spray. After 3 days spray a milk solution on both sides of the leaves. To make these sprays, read on the above. answers. Repeat after every 2 weeks. How to determine that the problem of rotting of fruits of bottle gourd are due to bad pollination, calcium deficiency or due some disease like phytophthora or by insect. Sir, I see many green Worms eating the new leaves and flower buds. Also the small fruits that are coming up have getting brown or red patches. Can you please suggest any solution. Spray with neem oil spray (read above comments for making neem oil spray). You could also flush out the bugs with a very dilute solution of detergent soap. sir, i have planted some okra plants (ladyfingers) and i wanted to know why the plants which are only 5 to 7 inches are already bearing its fruits? What should I do so that the plants grow taller? Thanks in advance. Remove all the flowers and fruits. Let the plants grow. i can't say the reason for early flowering, however, if you have planted very late in the season, then the plants can produce fruits quickly. My bottle gourds did start to grow, but just when they grew to a size of a finger and fat enough, these started wilting and drying up. Only one Gourd has grown to a length of a palm till now. I assume if two or more gourds are growing on the same branch then only one will get the nutrients, usually the one hanging below. How long does it take for the bottle gourd to grow a ripe fruit. Please do not post as Anonymous in future. As mentioned, you can write your name in the Name/URL option in the drop down box and can leave URL blank. 3-4 gourds can grow on a single branch. All the flowers are not getting pollinated. Try hand pollination of bottle gourd flowers. The fruit will be ready in 3-4 weeks. If your finger nail goes easily in the fruit, it is still soft and good. You should pluck the fruit when it starts to change color. How to save seeds from a bottle gourd? Do they have to ripen on the vine? I let one gourd grow for 3 weeks but I thought it was getting too heavy for the trellis and harvested it. Is it possible to get seeds from this gourd? How will I know when to harvest for good seeds for next season? Thanks you for the wonderful information. To make seeds, you have to ripen the bottle gourd fully on the vine, at this stage its color will slightly change and the skin will become hard. You can also wait till the gourd start to dry. A gourd growing for 3 weeks probably will not become ripe, however, if you collect its larger seeds and dry them, many will germinate next year. Hello, can the seeds be used after many years (I have seeds from 3 or 4 yrs old). Seeds of most vegetables will not germinate after 3 years. However, you can try old seeds, if they germinate then the fruits will be of the same quality as if they were grown from fresh seeds. I stay in Seattle and the current temp is 48 F (9 C) and plus it rains.Our summer is quite short.Last year I transplanted in July but by the time it could produce,winter started. Will the plant die if I transplant in current condition. Please advise me. 48 F is too low temperature for the plant. May try to plant in a pot and put the pot indoors in a warm room that also receives some sun. As the summer is yet to start in your area, you can wait for sometime to bring the plant outdoors. Sir please suggest name of fertiliser my plants are not showing good growth I am not sure what bothering them. Also want to know what type of soil bottle like I water than daily between 7 to 9 at night. Bottle gourd needs well draining rich soil. Add some compost or cow manure to the soil. Any fertilizer low in nitrogen and high in potassium will be good. The vine should be in sun. water in the morning so that any wet leaves dry up in the sun to protect the plant from any diseases. Just soak the seeds overnight in water and sow, scratching is not needed. If you sow the seed without soaking, it will take 2-3 days more to sprout. I am sincerely thankful and appreciate your valuable suggestions on home/roof based gardens. My concern is towards making a potassium rich compost using house hold items or least amount of artificial/chemical usage to promote organic farming. Potassium rich compost can be made by adding potassium rich materials into the compost bin. You could add wood ash (ash from burnt hardwood), banana peels, beets, tomatoes, spinach, lemon and orange rinds, etc. to raise the potassium content of the compost. You could also add seaweed leaves or liquid seaweed solution, comfrey leaves (Comfrey tea) and broad beans leaves into the pile which are rich in potassium. Add layers of poultry manures which is a good source of all the necessary nutrients, including potassium. Hi There- my bottle guard plant leaves are burning(turns yellowing edging and gradually dries out, flowers and female buds turns brown and falls off ) assuming due to adding excess of fertilizer. Is there a way to reverse and restore the plant. I am concerned as my plant just started fruiting. I don't see any more female buds after my first fruit yield..is that normal? Cut off the growing tips of some of the branches to encourage new growth and flower buds. This summer , I have planted 3 bottle guard plants. They are doing very well with lot of male and female flowers . I have close to first crop of 5 bottle guards to full shape . I am seeing on couple of fruits where fruits getting blackened out . I do hand pollination . I use the Seaweed solution as advised in your post . Attached is the image. My closely planted 2 sponge gourd vines have grown about 10 feet long & 1 meter wide with very large leaves but no flowering has appeared so far, please suggest. You may feed your bottle gourd vines a fertilizer high in potassium.Also cut the growing ends of branches longer than about a meter to encourage new branches? Blackening of the bottle gourd fruit may be due to some fungus development. Please read the prevention discussed in above comments. My bottle groud vegetable is turning yellow after hand pollination. Is it normal? I am concerned. Probably it has not been pollinated. Please wait for a few days and see if it is growing. My bottle gourd plant has droopy leaves? Why is it so? The leaves of bottle gourd hang down if the sun is too intense, but become alright in night and morning. Keep the soil damp. Hi Mr Mehta , First of all thanks for sharing deep knowledge regards the Gourd. This is my first time i am planting long Gourd in my back yard at NYC. Summer is not that hot as we all expected but i have three plants growing and one of them blooming flowers ( both male and female )and this one also three gourds ( around 4 inches ). Till last week things look ok but from this week i saw female buds are growing as they should and flowers are not open fully open that i could use hand pollination. Some couple of them turn brown. Most of the female flowers are close. what's your suggestion on that ? And other two growing on one branch but not may flowers as they should be. week ago i used miracle grow on my plants. We got little rain last week. Please suggest me what should i do for first one and other two. As i know we can at least 50+ gourd from each plant. Last week, I was in Ohio and I felt the day temperature has started to go down. Congratulations for growing bottle gourds in New York. You can cut the brown buds as they have not been pollinated. I do not know the reason for not opening of the female flowers, may be due to lowering of the temperature the opening time of flowers has changed (they can open in evening or early morning). For other plants, you may cut the growing ends of the branches to promote new growth and flower buds. Thanks for your reply. I will follow your suggestion. You think I can use yield phosphate (0-45-0 ) ? Also cutting leaves will hurt blooming ?? Let me know. Cutting the growing ends of the branches longer than 3 ft will encourage new growth and flowers. Using a fertilizer high in potassium and phosphorus will help. I have issue with my female bud. They are coming but they are getting yellow without getting big and few of them getting red dots on it. So big gourd and some of them are dying. What causing it and what's the remedy. Please help.